p. 1: Title I: Viage entretenido de Don Antonio de Contreras y su buelta a Roma a un señor Intitulado muy amigo suyo. 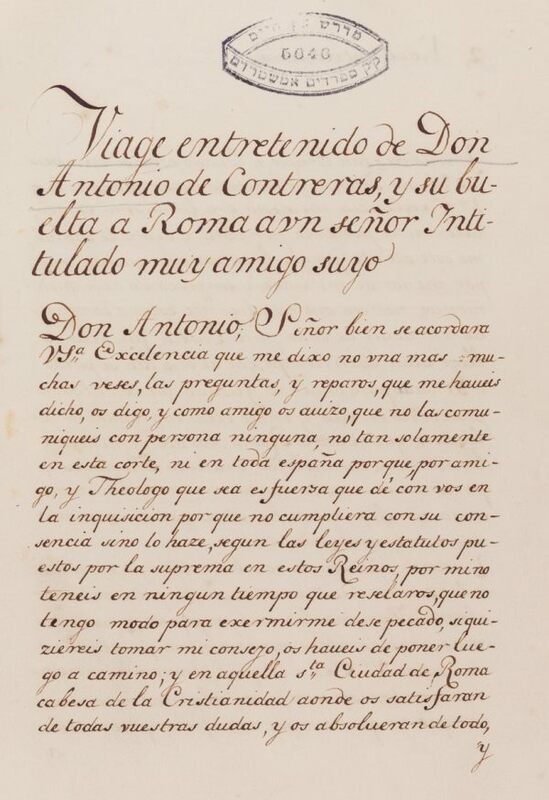 p. 1-14: Letter by Don Antonio de Contreras introducing his dialogue with Daniel of Livorno. p. 123-134: Continuation of the dialogue and conclusion of Contrera’s letter. p. 135-136: Response of Contreras’ friend to his letter. The manuscript begins with a letter written by Don Antonio de Contreras, Knight of the Order of Calatrava, to a friend in Madrid, in which he narrates the story of his encounter with Daniel, a brilliant Jewish boy in Livorno, on his way back from Rome. It follows his dialogue with the Jewish boy, which frames the narration of a disputation that Daniel had had with two Dominicans shortly before. In the middle of this dialogue, the manuscript incorporates a polemic discourse by Elijah Montalto. At the end, it is given the response of Contrera’s Madrid friend to his letter, in which he attests the veracity of the facts and reveals that he was responsible for its writing (“last year, I was in Livorno and, there, the same story was told to me in the same way you have narrated it. So, I had got it written to let the present and future generations know how strong the word and the Law of Adonay is, even for gentiles”). According to Carsten L. Wilke, this text must have been written between the publication of Juan Carrasco’s anti-Catholic pamphlet Carrascón (1633), which was one of its sources, and the Portuguese secession of December 1640, as the meanings of “Spanish” and “Portuguese” still overlap. It also incorporates extracts of another anonymous polemical work written in Antwerp in 1583, the “Marrakesh Dialogues”. There is a manuscript with the same title (Viage entretenido de Don Antonio de Contreras…) in the National Library of Madrid (cod. 18247). Another similar manuscript with a different title, Danielillo, ó Respuestas á los Cristianos. Escrito en Amsterdam por Isaac Mendes en el año de 1738, reposes in the Royal Library of Brussels (cod. 15181), which was edited in 1868 by Abraham Cohen Caplan. Wilke also refers to a fourth manuscript that existed in a private collection in Constantinople around 1859 with the title Respuesta contra Christianos, por Danielillo de Liorne. Carsten Wilke, The Marrakesh Dialogues: a gospel critique and Jewish apology from the Spain renaissance, Leiden, Brill, 2014. See a critical edition of this manuscript: Anne Langlois, Un ouvrage anti-chrétien anonyme: “Viaje entretenido de Don Antonio de Contreras”. M. A. Thesis, Paris, 1970 (typewritten copy at the Institut d’Etudes Hispaniques, Paris). See also Moisés Orfali, “Il ‘Danielillo’ da Livorno, testo e contesto”, Zakhor, 1, 1997, pp. 207-220. Bequeathed by Rabbi Jacob Ferares of The Hague in 1885. Spanish / Paper / 86,6 x 20,7 cm. / 136 pp. / 23-24 lines to a page / Neat current writing of the 18th century / Titles written on top of the text / Catchwords at the end of each page / Contemporary half-linen binding. Fuks 451. Fundação Calouste Gulbenkian.